While they’re sure signs that Easter is on its way, fresh flowers and baskets full of pastel-colored candy also represent potential health risks for your pets! As you’re making your home festive for the holiday, make sure you keep these Easter-related treats and decorations away from your pets. Lilies. Lilies can cause fatal kidney failure when cats ingest any part of them, even just the pollen! Either keep them up high away from nosy paws or keep them out of your house entirely. Chocolate. The darker the chocolate is, the more poisonous it is to your pets, but they shouldn’t have access to any kind of chocolate. So hide those chocolate bunnies! Plastic grass. If your Easter baskets are filled with bright green plastic grass, keep the baskets out of your pets’ sight so they aren’t tempted to chew (and potentially choke) on the fake grass. It looks real to them, but it can cause severe intestinal blockages. Plastic eggs. Don’t forget where you hide your eggs! 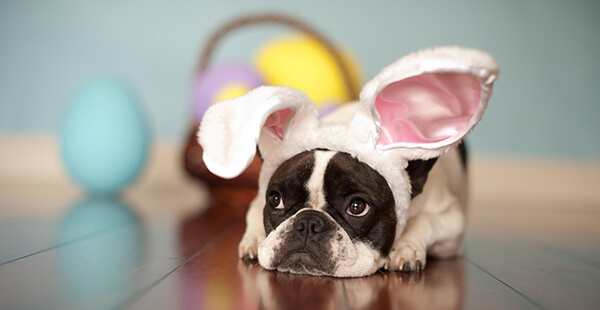 Pets could choke on shattered bits of plastic eggs or break them open and eat the candy inside. If your pet ever ingests these substances or any other toxic items, call Pet Medical Center of Edmond at (405) 757-2132.